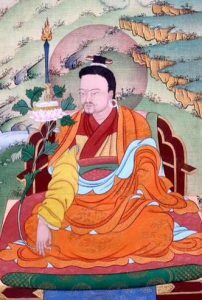 Rigdzin Jigme Lingpa was the conscious incarnation of King Trisong Detsen and Vimalamitra, who manifested at a time when the Dzogchen teachings were in danger of being diluted by intellectual speculation. He appeared as a monarch amongst tertöns, in accordance with the intent of the great master Padmasambhava, and revitalised the profound teachings of Dzogchen through his terma revelation of Longchen Nyingthig. Jigme Lingpa was born amidst amazing signs in 1730, in a village in Yoru, in Chongye Valley of Southern Tibet. From a young age he could recall many of his past lives, such as being the Tertön Sangye Lama (1000-1080?). One of his teeth was marked by the syllable AH, and he had thirty small moles in the shape of a vajra at his heart and another thirty in the shape of a bell at his navel. From childhood he was extraordinarily compassionate and kind, and had little interest in the usual worldly preoccupations. At the age of six, Jigme Lingpa was ordained as a novice at Palri Tekchok Ling (Shri Parvatai Ling) in the Chongye Valley. Because he came from a family of simple means, he was extremely poor; a situation that he would later declare was something of a blessing for his spiritual path. The humble circumstances of his upbringing meant that he was free of the responsibilities and expectations that attend a position of wealth and status. Between the ages of six and thirteen he lived as an ordinary monk, studying the scriptures, logic, grammar, poetics, medicine and astrology according to the curriculum. Besides these studies, he had little inclination (or opportunity) for further academic study under a master. However his inner life, unbeknownst to others, was already manifesting signs of the great being that he was to become. He experienced countless visions and meditative experiences, and naturally had great faith in the Dharma and especially in Guru Rinpoche. At the age of thirteen he met the Tertön Rigdzin Thukchok Dorje, feeling a strong and spontaneous faith in him, a sign that this master would become his root Lama. From Thukchok Dorje, Drimé Lingpa, his uncle Dharmakirti, Chakzampa Tendzin Yeshe Lhündrup, Neten Kunzang Öser, and many other masters, he began to receive the maturing empowerments and liberating instructions of the Vajrayana path. In particular he received transmission of the terma cycles Trölthik Gongpa Rangtröl and Lama Gongdü, Mahamudra teachings, and the Seven Treasures and Three Cycles of Longchen Rabjam. It was through studying these latter works and others by Longchenpa that Jigme Lingpa came to consider the Omniscient Master as a fully awakened second Buddha. He then entered retreat at Palri Tekchok Ling, focussing primarily on the development and completion stages of Trölthik Gongpa Rangtröl, and quickly showed signs of accomplishment of body speech and mind. He experienced visions of Guru Rinpoche and Yeshe Tsogyal, Manjushrimitra and others; gained control over the channels, winds and essences of his subtle body; and could see many of his past lives. Due to these realisations and experiences, a wealth of teaching was released within his mind and he composed his first major treatise, a commentary on the Lama Gongdü. At this time he also exchanged his maroon monastic robes for the white clothing of a tantric practitioner. The entirety of the teachings and realisations of the Longchen Nyingthig, the inheritance that had been entrusted to him by Guru Rinpoche, was thus awakened within his being. In this way he became the tertön of the Longchen Nyingthig. Understanding that the time was not yet right to unveil these secret teachings and that he, as the tertön, had to practice them first, he entered a three year retreat at the Sangchen Metok Puk Cave at Chimphu. During this retreat he had three pure visions of the Omniscient One, Longchenpa, which awakened in Jigme Lingpa the highest realisation of Dzogchen. In the first vision, Jigme Lingpa received the blessing of Longchenpa’s vajra body, empowering him with the words and meaning of Longchenpa’s teachings. In the second, he received the blessing of Longchenpa’s vajra speech and the permission to uphold and propagate Longchenpa’s teachings as his representative. In the third and last vision, the enlightened awareness of Longchenpa’s vajra mind was awakened in Jigme Lingpa and he became a master who had realised the ultimate lineage. Jigme Lingpa had received, in these instantaneous transmissions from Longchenpa, all the key points of the Tantras, explanatory commentaries, and pith instructions of the Nyingthig teachings. However, in order to also inspire confidence in others in the mainstream oral tradition (Kama) and to ensure that the long transmission of pith instructions from Indian and Tibetan masters would not be broken, he requested and received the cycles of Dzogchen teachings from various teachers. He kept his revelations secret for seven years, after which he saw that the time was ripe to present the teachings known as the Longchen Nyingthig (Heart Essence of the Vast Expanse or, The Heart Drop of Longchenpa). Accordingly, in 1765 he bestowed the empowerments and explanations of the on a group of fifteen disciples. Throughout his time Jigme Lingpa lived as a carefree yogi, adopting the ways of a wandering mendicant who, although he appeared to be an ordinary lay practitioner, was in fact a fearless awareness holder who was completely free and open within. Carrying his few possessions on his back, he frequented mountains and caves, glaciers and lakes, all the while surrounded by hosts of dakas and dakinis who gathered like clouds. Although his years of retreat at Chimphu had taken their toll on his body and subtle energy systems, his all-encompassing realisation of Dzogchen meant that all such obstacles became enhancements and adornments to his view, serving only to fuel his renunciation, devotion and compassion for beings. His illnesses therefore soon dissolved into the absolute nature. He gradually codified the many teachings and practices of his terma, including the sadhanas of the Three Roots and the three cycles concerning guru yoga, Dzogchen, and Avalokiteshvara. More specifically, he composed the root text and auto-commentary of his Yönten Rinpoche Dzöd (Treasury of Enlightened Qualities or, Treasury of Precious Qualities) as an elucidation of Longchenpa’s teachings; and Yeshe Lama (Timeless Awareness as the Guiding Principle) with its background material. This latter work has become the most comprehensive manual of Dzogchen in the Nyingma. These are included in the nine volumes of his collected works, which brought about a renaissance of the teachings on the heart essence. At the age of thirty-four, he established his seat at Tsering Jong in the Tönkhar Valley of Chongye in Southern Tibet. Eschewing a large institutional structure, he instead built a simple hermitage with a meditation school, where he spent most of the remainder of his life. Disciples flocked to him from far and wide like water birds to a lake, and he turned the wheel of the profound Dharma, primarily imparting his own Nyingthig teachings. In turn, these disciples returned to their homelands and practiced and disseminated the Longchen Nyingthig, so that this precious terma and its empowerments, commentaries, instructions and ritual practices became a mainstay of the Ancient Lineage. Despite having established Tsering Jong and even though he became famous as a truly great master, Jigme Lingpa remained a simple hermit and had no interest in wealth, power or status. Although many illustrious masters and prominent members of society came to receive teachings, Jigme Lingpa was only really interested in genuine practitioners who could uphold the lineage, regardless of their background. Whatever offerings he received he used for the sake of the Dharma, such as having the Collected Nyingma Tantras printed in gold and silver, sponsoring many representations of enlightened body, speech and mind, and ransoming the lives of many beings from certain death. He also settled many disputes and border wars that threatened the peace and stability of Tibet. He continued teaching, giving transmissions and benefitting beings in innumerable ways until 1798, his seventieth year, when he began to show signs of sickness. Even then he continued to see disciples and give blessings at Tsering Jong, while outside a rain of flowers fell around his residence and many small tremors shook the earth. On the third day of the ninth month, a beautiful fragrance pervaded the air and a light rain fell miraculously from a pure blue sky. That night, Jigme Lingpa sat in the sage posture and passed naturally into the expanse of the primordial nature. Thus he came to the end of his life, having ensured the spontaneous accomplishment of the two kinds of benefit as a glorious protector of all the teachings and all beings. After his death, a number of sublime incarnations appeared, including Do Khyentse Yeshe Dorje (1800-1866), Patrül Rinpoche (1808-1887, and Jamyang Khyentse Wangpo (1820-1892. Each of these incarnations were incomparable in their own right, and spread the teachings of the Early Translation school in the ten directions. Jigme Lingpa had countless disciples, many of whom were great masters who served beings and the teachings on a vast scale. In particular, foremost among those who went on to hold the Longchen Nyingthig lineage were his four heart sons, “the four named Jigme”: The First Dodrubchen, Jigme Trinley Öser (1745-1821), Jigme Gyalwa Nyugu (1765-1843), Lama Jigme Kündröl Namgyal (18th-19th centuries) of Bhutan, and Lama Jigme Ngotsar Tendzin (18th-19th centuries) of Getse Monastery. These lineage holders and, in turn, their disciples, would ensure that the Longchen Nyingthig cycle, and the profound writings of Rigdzin Jigme Lingpa would spread their incalculable benefit to every corner of not only the Nyingma tradition, but in more recent years, all over the entire world.